For our second experience with seitan, it was time to get trashy. 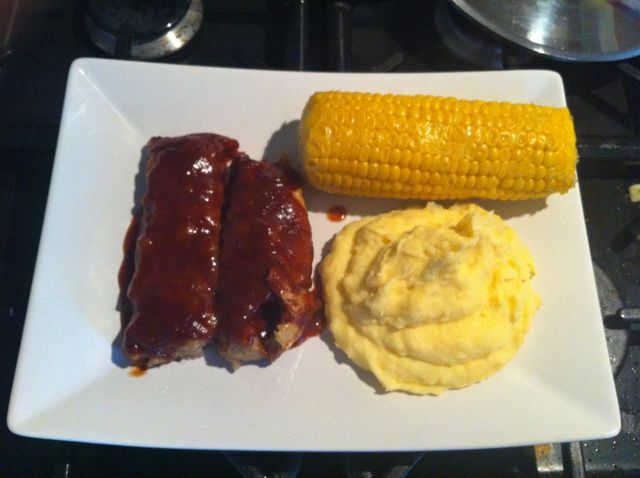 The posh, dinner-party-worthy stuffed roulade was a distant memory and I treated Benj to a bit of an indoor cowboy cookout complete with mock barbecue ‘ribs’, corn on the cob and fluffy mashed potatoes. 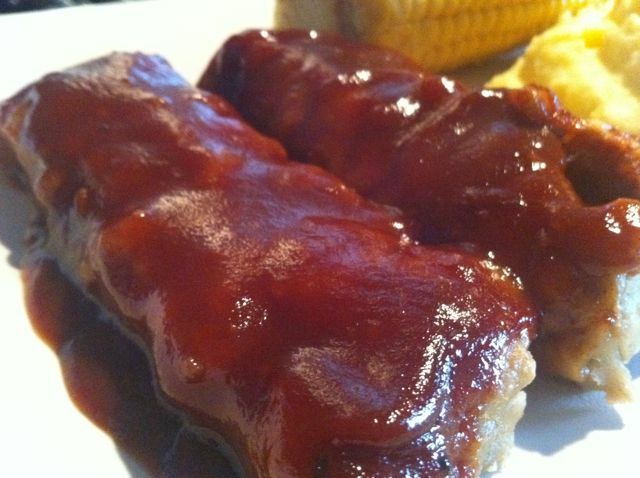 I followed the recipe for seitan ‘ribz’ from Fat Free Vegan Kitchen with a few tweaks and lazy-boy changes, notably the complete omission of my own homemade BBQ sauce and the introduction of one Budweiser Honey BBQ glaze that we were both extremely excited for. That is, until I checked the back of the jar in a rare ‘lightbulb’ moment to see that the ingredients included worcester sauce, which included anchovies. Not very vegetarian. This would be fine, except we’d already bought the sauce and were nanoseconds away from slathering it all over the very much vegetarian ribs. Plus, both of us had an alcoholic beverage in hand, thus removing the ability to replace the offending item. So, I ended up making my own BBQ sauce after all! Which turned out wonderfully, despite the limited ingredients on hand. The recipe was really easy to follow and once the dough was made (literally a 5 minute job!) I pressed it into a glass baking dish and cut it into strips to replicate actual ribs. It looked so appetising! Not. It looks like brains, lets be honest. But I was confident it would be a flavour sensation with some quality oven time, a generous covering of sauce and a stellar line-up of side dishes. Once the seitan had baked for about half an hour I removed it. I was really impressed with the texture of it – much like the roulade it was chewy and dense with a lovely browned, slightly crispy top from the oven. 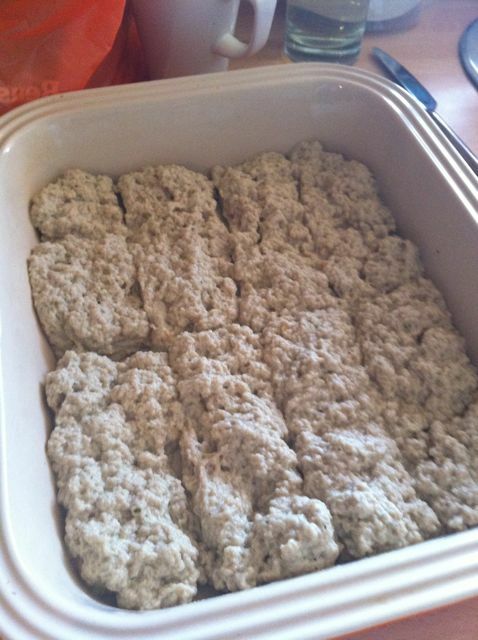 I’ve bookmarked lots of recipes for boiled seitan and we’ll definitely try it one day but for now I can’t stop making the baked version! So the seitan was out of the oven, cooling slightly on the counter and all ready for some serious sauce application and then we had Saucegate. I was slightly livid because the whole meal was based around this sauce and now poor Benj couldn’t have any. Panic not, my boy! I hit up Google and using a combination of about 5 ‘Simple Barbecue Sauce’ recipes I came up with a satisfactory combination that miraculously mixed together to actually taste like BBQ sauce. For the record, I used ketchup, brown sugar, mustard powder and soy sauce in varying amounts until I hit the jackpot. Heated up gently in a pan it was even better! With the seal of approval from Ben, we were back on track. Wearing my special smug face which I reserve exclusively for kitchen successes, I sliced the rib slab into two (cutting the dough before cooking it was a real help as the perforation ensured a clean cut afterwards) and put them into two different baking trays as we now had a Code Red veggie vs meaty situation on our hands and needed to avoid cross contamination. Ben said I was more than welcome to use the homemade BBQ sauce since I made a lot but I really had thought of nothing but the Bud sauce since we bought it a few hours earlier, and nothing was going to get in the way of that. I do think the surprise addition of anchovies in the sauce has made Ben think a lot more about what he’s buying though and he thanked me profusely for ‘saving him’ afterwards! Bless. It’s surprising how many products that you would never think twice about do contain animal products. I spread the Bud sauce on my ribs and the homemade one on Ben’s and we put them in the oven to finish off for the last 10 minutes. I was hoping the sauce would get a bit caramelised and sticky and seep into the seitan. Yum! While the ribs were finishing off we completed our side dishes. Lovely, fresh whole corn on the cob with butter and salt alongside smooth, fluffy mashed potatoes with milk, garlic and slightly more butter than was really necessary. After years of forgoing mashed potato I am now firmly back in the MP camp after learning to make it myself. My favourite way to eat the carby wonder product is still in baked form (with super crispy, olive oiled and salted skin) but I find myself longing for the comfort of mash a lot more now. We removed the ribs from the oven and the sauce had indeed caramalised nicely, making them smell amazing and even look very similar to actual ribs! I love how the mashed potatoes in that photo would almost not look out of place on a pavement…if you catch my drift. The recipe made enough for 8 ribs and due to the thickness and sheer size of each one, we could only manage a pitiful 3 each. Embarrassing. That meant leftovers though! Lunch the following day, in a bread roll with extra sauce. Yum! Please make these if you have any interest in vegetarian barbecue food – they were so quick and easy and so much more exciting than the usual veggie burgers or sausages that find their way onto barbecues in the summer. Surprise the vegetarian in your life! 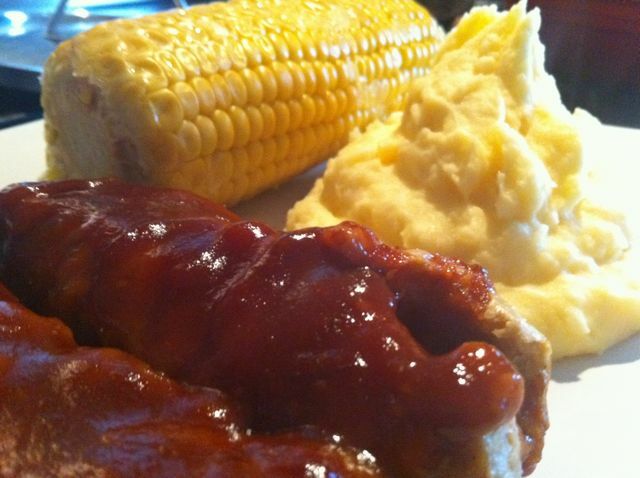 You could even push the boat out and make BONES for the ribs a la A Vegan For Dinner! Love that commitment!